My father, Jim Shaw, moved from Edinburgh to take up employment with the Rover Company at Solihull in July 1950. Once he had found a house in Sheldon, Birmingham my mother joined him, bringing me, as a toddler, with her. 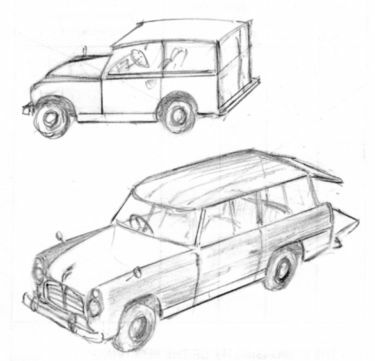 Obviously I don't recall the earliest years but I know that dad worked at first with John Cullen in the Experimental Department, mainly for Land-Rover, but also with Chris Goode on P4. Although he had inherited a Vauxhall car from his father I don't think he drove it much. Perhaps it was an expense that he couldn't afford? Ours was one of the few houses in the road with a drive and a garage. As the house was built on a bank the driveway slopped up to the garage so we always called it 'the slope'. The garage would have been a standard single car stand-alone building and possibly the Vauxhall was kept in there. During these early years dad demolished the garage and built a new one with a workshop to one side and a lot of storage space on the other side and to the real. As was typical for dad it was designed so that from the road to look pretty much like a single garage, the 'wings' being hidden by high hedges on either side of the door. The main door was up-and-over and counterbalanced by a specially cast concrete weight. There was a system of pulleys to produce the right mechanical advantage. We were always fascinated by the gutter system, water from right-hand side was transferred by a pipe below the roof to the drain on the left-hand side. We would climb up and pour water in the gutter then race around to the drain to watch it come out! We could play the same game with a small rubber ball too! Once the new garage had been completed the Vauxhall moved indoors, having been previously sheeted over on the slope. 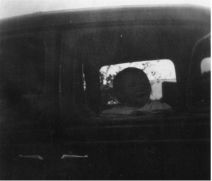 I remember that all the windows had yellowed and dad took the car and me over to Nechells where the windows were replaced. Shortly after that the car was sold. Around that time the Queen and the Duke of Edinburgh were supposed to visit Solihull, perhaps to take delivery of their 'Queenmobile'? Dad drew a picture of it with, I think, a red ink wash. It was supposed to be presented to the Queen. I know that I got a pack of Rover brochures around that time that had been planned as a small gift for Prince Charles. Did the visit get cancelled or maybe they didn't get presented? The move to working on P4 must have spelled the end of dad's bike ride to work. There was now nearly always a P4 on the drive each evening. As children we were fascinated by the tool tray under the front shelf, the spring-loaded grab-straps in the rear and the 'secret' spare wheel tray. Even then we realised that the hand-brake lever was 'weird'. It is difficult to put my memories in order but some things stand out. All of the works car carried a Pyrene fire extinguisher mounted at the side of the front passenger foot-well and they all bore a little ivory-coloured engraved plate screwed onto the, (originally), wooden dashboard capping, stating that it belonged to the 'Experimental Dept.'. Sometimes cars would turn up with extra instrumentation, like 'decel' gauges. There was one P4 that was fitted with chromium-plated plastic door handles. Whether it proved too hard to plate the 'buttons' I don't know but they were plain red. The reason for this trial was that the usual metal handles were thought to be too cold to the touch on chilly days. Early P4s had aluminium skinned doors and it was thought that they were too easy to dent if customers pushed the door panel rather than the handle. For a while there was a P4 driving around with flat bags of lead shot on the floor to add the extra weight that steel door panels would produce. 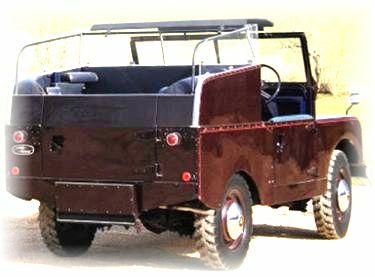 There was also a P4 that was fitted with a Land-Rover diesel engine, perhaps to satisfy the all-diesel farmers' market? I remember one P4 that arrived with heavy weights in the boot. Dad had to reduce the weight when we went on a family visit to Cumbria. Perhaps that was an experiment anticipating the fitting of a heavier (V-6?) engine? It wasn't unusual to see a car with 'odd' additions, like tufts of wool on the bodywork to check airflow. Later on P5s started to work into the mix of visiting cars. 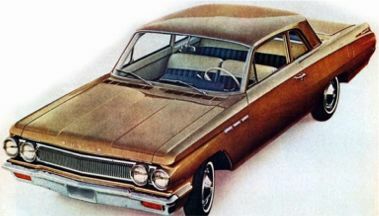 The first models had small window strips above the side windows, which was a reversion to older ideas. I think the sleek rocket-like stems on the instrument panel switches was the thing that mostly struck me as being 'different' . I remember dad making mock-ups of the automatic gear change, (the little window that indicated the lever position). He also made a mock-up of a Canadian 'license' plate for P5 at home. There was certainly at least one visit by a P5 estate car that Pressed Steel had made. My only real memory of that was a little chain that hung from the middle of the tailgate. What it was supposed to do I don't know - the answer that I got from my dad was that it was 'broken'. It is remarkable but in those days our road was virtually free of traffic. The milkmen, bakers, coal lorries and telephone vans seemed to be the only traffic of note. Certainly the only parked vehicles in the evening would be a tipper truck at the far end of the road and an articulated lorry belonging to Canning's, (a chemical supplier). Suffice it to say that when a strange car turned up outside our house so did all the boys from what seemed miles around! When that car was foreign the interest was even greater! These strange vehicles were actually owned by Rover, presumably bought so as to see whether there was anything to learn from other car makers and whether the exotic features were actually worth emulating. The first of these cars that I remember was a Citroën DS 19, [some say that it was the cheaper ID 19]. Even now I think it would attract some attention, though not from small boys. This example was a pale yellow colour that continued inside as well. Not very 'Rover'! Personally I thought that the single-spoke steering wheel was a bit too risky. My dad pointed out that the sides of the slots that the ventilation controls protruded through were rough though painted over. An interesting car but poorly built. 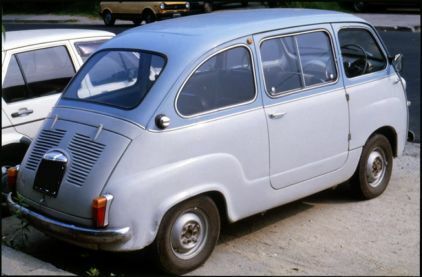 The next car that I remember was a Fiat 600 micro-bus, as we called it. In theory it could seat six. When the first mini (Austin 7/Morris Mini Minor) was announced in 1959 I couldn't help but wonder what the fuss was, I had seen smaller already. [Actually the Mini was 18" shorter, but the Fiat seated six!] From a child's point of view the Fiat was certainly cute. 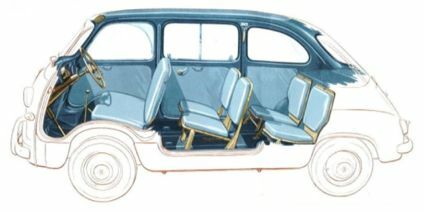 Fiat 600 - A cute six-seater! Following on from this was something a bit more local, a Jaguar X150. Probably this impressed dad more than it did me. 'Names' have never been important to me; I was never a car 'fan' the way he was. Cramped and old-fashioned was probably my thoughts. Often when dad brought home something special I would get to have a run in it. Usually this would be down the Coventry Road (A45) and out to the Stonebridge roundabout and back. (This was before the flyover and mess of speed restrictions around the airport). This time dad wanted something better so he took it out to the M45 spur that had been recently opened. I rather think he manage to achieve 'the ton'! In those days there was no speed limit on the motorways. I can remember saying that there was no need to signal for a lane change on a motorway because, "if you can see a car in your mirror you shouldn't move out!". That probably made sense if you were driving at 40 mph with potentially someone bearing down on you at 120 mph, now some people drive in a convoy block at 80 mph and the front and rear badges of the cars behind and ahead below their sight line! The last foreign car that I recall was a Buick. By that time we had moved or were moving to South Yardley so that must have been late 1964. I am pretty certain that it had two-doors and it was a 'brown'. It probably only appeared once, arriving early evening and going away the following morning.. Clearly this had been bought so as to see what the V-8 engine that Rover had acquired from General Motors was like in its native platform. I remember being taken down the Coventry Road and passing the Wheatsheaf junction. The car was certainly nippy but I don't think dad pushed it hard, we possibly stayed with the 'city limits', as the Americans would say. When we made the house move another change took place, we got our first Rover! Except it wasn't a Rover, it was a Talago, the disguise for the first P6s. This meant that most evenings it was the same car that came home. From time to time something different would turn up, particularly if dad was about to depart on a trip to Europe when the car would start and end its main run from home. In retrospect I don't remember so much variety in these later years. Perhaps that was because there weren't so many different cars, perhaps we didn't play outside anymore, (too much homework!). There was more discussion about technical issues, like anti-lock braking and fuel injection. (I remember dad talking about persuading people to adopt a 'spill pot', filled by the fuel return pipe so that a small fuel reserve was available if vehicle motion caused fuel in the tank to surge away from the feed pipe). I remember a 5-cyclinder 'P6' turning up several times. That was what we called it - apparently it was really a P7! I don't think dad had much to do with Range-Rover but we certainly had one visit shortly after its launch. It was certainly different and I liked the driving position, it felt 'people-sized' while set in a 'large' vehicle. Dad took one up to Scotland for a family wedding. When he got there he was told that he couldn't take a 'truck' to the wedding and he had to borrow a Hillman Imp. Rather like the original Mini the Range-Rover was soon adopted by the 'Rich and Famous' so given a few more months and it would have been welcomed with open arms! By this time dad had become Rover's brake specialist and that led to him getting one unusual SD1 for a while. This was a white car with orange stripes, the 'jam sandwich' that the police operated at the time. This one had no blue lights and 'Police' was covered in white tape. It was certainly amusing going for a ride in that beastie as other drivers rapidly changed their behaviour on our approach. The back-story was that the Metropolitan Police had been claiming that the brake pads on their SD1s had been wearing out too rapidly. Dad had gone down to Hendon and said "show me". He was taken on a 'fast' ride around their circuit, then he got to get behind the wheel. He claimed that he beat their time and never touched the brakes - "anticipation", he said. Certainly he always maintained that the Police think that Newton's Laws don't apply to them - they get away with it because other people get out of their way - sometimes. In retrospect I grew up in Rover's golden years, when anything seemed possible - The New Elizabethan Age! By the time I was going to university and mostly away from home the company was going through the various mergers reshaping the UK car industry. Dad went through a succession of leased 'group' cars so when I was home it would me most likely be one of those, finally getting his own car again when he retired in 1983.